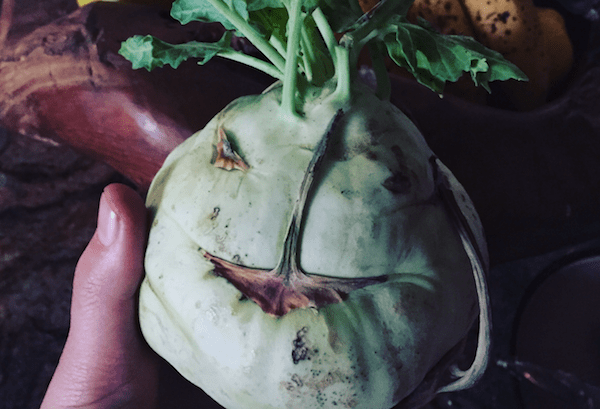 Kohlrabi is a perennial, cool season vegetable. It is grown all over the temperate climates for its succulent round shaped modified stem as well for its turnip-flavored top greens. You can get them in Dunnes Stores nationwide and I urge you to try these out. In terms of its nutritional content it’s just off the cuff! Mildly sweet, crispy textured kohlrabi is notably rich in vitamins and dietary fiber; however, it has only 27 calories per 100 g, a negligible amount of fat, and zero cholesterol. It has a rich source of vitamin-C; provides 62 mg per 100 g weight that is about 102% of RDA. Vitamin C (ascorbic acid) is a water-soluble vitamin, and powerful anti-oxidant. It helps the human body maintain healthy connective tissue, teeth, and gum. Its anti-oxidant property helps the human body protect from diseases and cancers by scavenging harmful free radicals from the body. Can we have a hell yeah for this amazing vegetable! Now here is a real first timers simple meal I put together – the fritters are sweet and strong in flavour and you can serve them with anything! Today I mixed raw food and the fritters for an immersed light summer meal. So it would also be great for a BBQ or light snack! Chop the leaves off the kohlrabi and peel the bulb. Then – Peel 1 carrot. Next, grate the vegetables by hand using a grater. Squeeze the shredded vegetables in a tea cloth (or with your hands) to remove moisture, then add to a medium bowl with the cup of flour, 1 tablespoon of chia seeds , ¼ teaspoon kosher salt, 1/4 teaspoon of pepper and ¼ teaspoon of salt. Mix to combine. Place ½ cup olive oil in a frying pan (enough for ¼-inch depth). Heat the oil over medium heat, then place small patties of the fritter mixture into the oil. Fry on one side until browned, then fry on the other side. Remove and place on a plate lined with a paper towel to drain excess oil. Plate up on a bed of raw red cabbage shredded and raw organic radishes whole. This earthy balance will satisfy the tastebuds.